I came across Dr. Mark Hunter of the Univ. of Michigan and his Hunter Lab website and their interesting research of Monarch butterflies, the protozoan parasite – Ophryocystis elektroscirrha (OE), and climate change. I asked him a number of questions and he was nice enough to answer them – here are his answers. 1) How deadly is OE to Monarchs. Obviously it’s not 100% fatal, but I’m wondering what the percentages are?OE is not usually lethal to butterflies. Most survive the disease. But I’ve seen up to 20% mortality if the butterflies have some other source of stress. But, in most circumstances, it doesn’t kill them. But it does cause large reductions in lifespan and in birth rates. So the disease can have significant impacts on monarch populations by reducing the number of eggs laid each year. 2) Apparently Asclepias curassavica helps survival, but doesn’t that just spread the disease even more? Your comment about Asclepias curassavica helping as a medicine, but increasing disease spread, is very astute. It has great medicinal properties, but should not be used as the only source of food for butterflies. This is like putting all of our kids on antibiotics from birth onwards – all it does is select for virulence in the parasite. So we would end up with parasites that are much worse for the monarchs. 3) Have you seen any data to show that Monarchs are developing any sort of resistance to this parasite? There is evidence to suggest that there is some variation among monarch populations in resistance. But the disease occurs world-wide, and there are no fully-resistant populations. In general, parasites evolve faster than their hosts, so they usually overcome host resistance at some point. 4) Since Monarchs have lost most of their Common Milkweed farm habitat, I’m looking for the best milkweed alternative for the home gardener. I always encourage people to plant a diverse group of milkweed species, native to their own location. This way, we let the butterflies choose what they need when they most need it. If you let me know where you live, I can make some recommendations for particular species. Here in Michigan, I recommend a mixture of syriaca, sullivantii, tuberosa, exaltata (if you have shade) and incarnata (if you have wetter areas). But the key is to plant a mixture so that the butterflies get a choice and we don’t select for virulent parasites. Below is a video on some of the research he is doing. This particular milkweed has been the focal point of some recent controversy, so I thought I would put together as much research as I could find on this Monarch favorite. 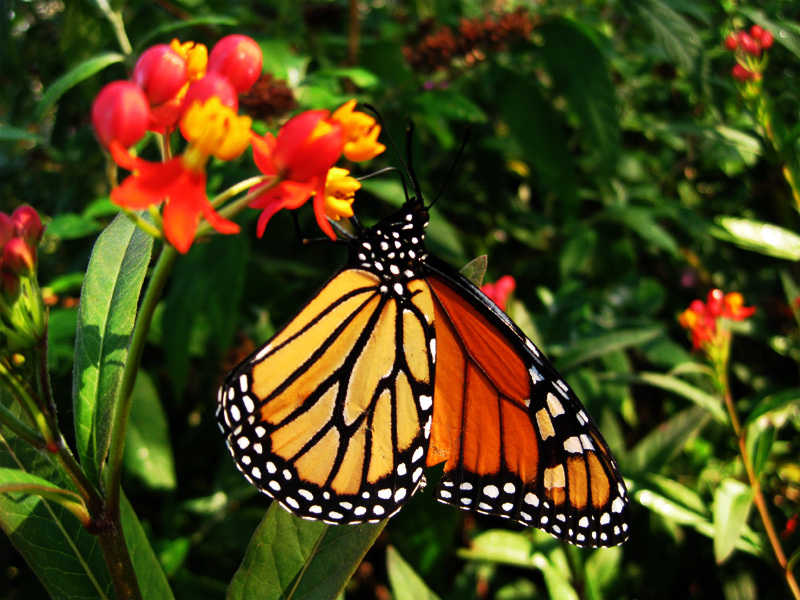 Definition – Ophryocystis elektroscirrha (OE) is a protozoan parasite that infects Monarch and Queen butterflies. Karen Oberhauser indicates that in Southern and Costal States + California – that OE can be a problem as the plants don’t die and OE can build up. Some sites advise to cut it down to the ground at the end of the season if you are in one of the warmer climates. Thanks to Andy S. with this article from SciencMag.org. It again talks about the Southern State problem with OE and what can be done. Here’s a recent TedTalk which seems to indicate that Curassaivica is good for Monarchs and is in fact medicinal against OE. I emailed Chip Taylor, a well known expert in this field, about this video and this is his response. “I haven’t had time to view the TED but here is my take from what I know about the issues. There is a twist to the story – or interpretation. Monarchs surviving on A.c. having acquired an infestation of spores – are able to mate and pass on the spores to offspring since spores would be transferred to the new eggs or surrounding leaves. Monarchs receiving similar doses of O.e. spores but which have fed on other milkweeds would likely die – ending transmission to the next generation. If you follow this, O.e. is a self-limiting disease (but you will never hear the researchers talking about it in these terms). Mortality/viability is dose related. Too much and you are dead, a little bit and you live to carry to spores to the next gen. A.c. allows more to survive and hence favors spore transmission. Dr. Jeffrey Glassberg, the President of NABA, North American Butterfly Association, wrote an article in the Winter 2014 issue of American Butterflies. Here’s the PDF. He says, “There is little evidence to support the idea that planting Tropical Milkweed will weaken Monarch populations and NO evidence to support the idea that Tropical Milkweeds are trapping Monarchs and stopping them from migrating to Mexico. Here is a AskNature Article with the same information as the video. Cardenolides per Species – interesting that Curassaivica has a very high percentage. San Antonio note – I got this email from a woman who lives in San Antonio. 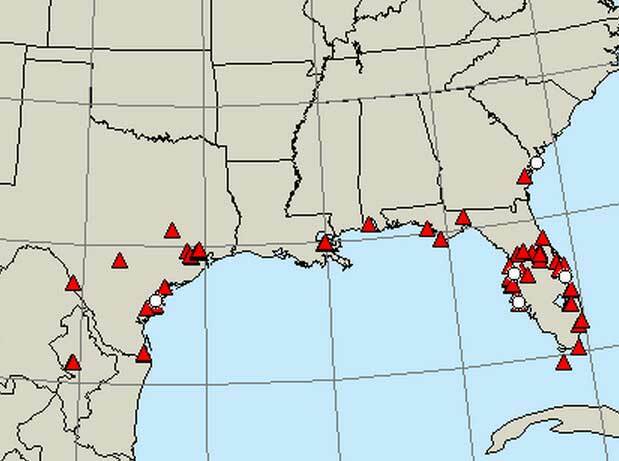 She said, “Monarchs are staying at the A. currasavica milkweed patch on the San Antonio Riverwalk all winter.” If you also look at the map below, you will see a lot of Monarchs do seem to stay in the southern states over the winter. Curassavica does seem to be stopping these Monarchs from migrating. My summation – it always makes sense to be aware of the OE problem and if in the South or California to take measures to limit use of Asclepias curassavica or at least cut it back a couple times a year. While only 8% of migrating Monarchs have OE, 85 % of the non-migrating Florida population have it. In Missouri – since tropical milkweed dies with the frost, spore transmission is not a problem. What I have observed over the last 18 years is that even though I have a large tropical milkweed patch in October, as soon as we get a cool spell and the winds are moving in a southerly direction, the Monarchs take off on their migration. One of the problems I’ve noted over the last few years is that some of my purple coneflower – Echinacea, is not forming its flowers properly. Instead of the nice purple flowers, the flowers are green, stunted and malformed. I’ve finally figured out the cause and it’s called Aster Yellows Disease. It’s a disease which is passed from one plant to the next by the leaf-hopper and there is no practical cure. The only thing you can do is dig out the affected plants and get rid of them. While this disease can also infect other plants, asters, marigold and coreopsis, it doesn’t seem to be infecting those plants in my garden. One solution I’ve found is to save seed from healthy plants and plant the seed in November. Then you will have new healthy plants next year even if you have to discard diseased plants now. I’m also testing out cutting off just the diseased flowers and see if that will stop the spread of the disease. Note – it doesn’t seem to work – I end up digginup and disposing of the plant. According to MoBot, do not put this in a compost pile or recycling bag. Put this in the trash so that the disease does not spread.